Colin Quinn: Long Story Short debuts tonight on HBO at 10 p.m. Eastern. The trend in one-person shows right now is to take a narrative approach—start with an unbelievable personal story and weave in tangential observations that feed a larger point. Comics like Mike Birbiglia and the late Mike DeStefano are/were masters of the form, inspired by, not surprisingly, places like This American Life and The Moth. The older generation of comedians, though, is made up of storytellers of a different stripe: clear, clever narratives where there wasn't one before. 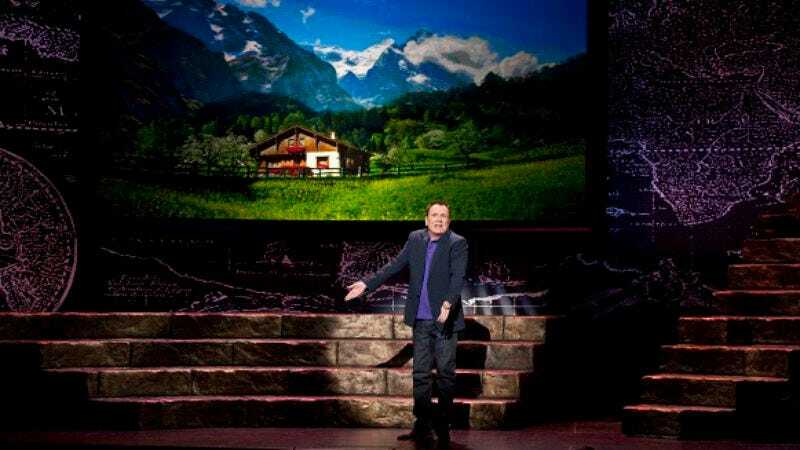 Eddie Izzard is one of the finest practitioners of the form; one of his recent theater tours took the topic of religion and analyzed it from every angle, providing a modern context for archaic Bible stories. He's a big enough comedian that his hyper-polished act feels like a one-man show, where there's attention paid that the script makes a larger, insightful point. It's not a one-man show in the formal sense, though. It's just another part of the act. Colin Quinn's one-man show Long Story Short is that type of one-man show. It's an old-school, comedian-as-truth-teller piece of material that's not personal but certainly not impersonal. Quinn's 75-or-so minute retelling of the world's social history draws upon modern references (like Twitter) to place historic events in a comedic context. It's labeled a one-man show, but it feels a lot like when Izzard, or someone like Cosby, tours through a theater. It's a trial run for Quinn as a modern day Seinfeld, and it works most of the time. Of course, Jerry Seinfeld directed Long Story Short's stage show, which ran for a while in New York prior to this HBO taping. There are pieces that ring similar to a Seinfeld routine: As Quinn builds to a larger point, he's careful to keep the audience engaged with observational asides and quick turns-of-phrase. The entire piece is jam-packed with pithy one-liners that can be taken in any context, and while some are pretty darn clever ("Armies didn't scare India, because they believed in reincarnation"), the sheer volume of them is a lot to get used to. The pace of the show is frantic, and it, too, takes some getting used to. Every time Quinn teases one of his big picture ideas—like about how we base our reality on skewed perceptions of ourselves, which have morphed subtly over time—it's surrounded by three or four lines. Long Story Short is masterfully written, which means at times it leaves audiences winded. The pauses are few, and when they come, they instantly capture the audience's attention. At one point, Quinn breaks up the routine by comparing Caesar to Ray Liotta, then launching into a Goodfellas-esque description of the way Caesar ran his business. It's amazing how much of the film and its mafia descriptions can be applied to Caesar, and the juxtaposition carries Long Story Short smoothly into the next segment. Yes, the piece is broken up into segments, one for each ancient empire (Greeks, Romans, British, etc). They're about 10 minutes long each, and often the breaks come when Quinn hasn't yet made his point yet. I chalk it up to Seinfeld's direction, at least his rapid-fire instincts. When Seinfeld pushes Quinn to deconstruct his points, like the Caesar thing or a bit about martyrs being high-and-mighty, Quinn's act begins to cohere. There are parts of Long Story Short that don't work, but overall, it teases the kind of career Quinn can sustain. It's rife with dime-store philosophy, hanging complex social ideas on day-to-day observations. He makes a larger point about the Chinese people, for example, based on the way he's seen them behave on the New York City subway. It would feel cheap if Quinn did it once or twice and called it a day, but he sticks by his observations, commenting on a bunch of historical time periods and the clashing of cultures that came from each one. In the end, it's discovered Quinn's been mocking Americans the entire time, and the discovery of his nuanced criticism—slowly revealed over time—is what gives Long Story Short its flair.